The Winter Storm Watch that was originally issued along the Palmer Divide has been upgraded to a Winter Weather Advisory. ANYWHERE FROM 6 TO 12 INCHES BY LATE FRIDAY EVENING. WET HEAVY SNOW ACCUMULATING ON BRANCHES AND POWER LINES COULD LEAD TO TREE DAMAGE AND POWER OUTAGES. ROADS MAY BECOME SLUSHY AND POSSIBLY SNOW COVERED TONIGHT AND AGAIN FRIDAY EVENING. DUE TO THE HIGHER SUN ANGLE THIS TIME OF YEAR ROADS AND HIGHWAYS MAY NOT SEE MUCH IF ANY SNOW ACCUMULATION DURING THE DAYLIGHT HOURS ON FRIDAY. A WINTER WEATHER ADVISORY FOR SNOW MEANS THAT PERIODS OF SNOW WILL CAUSE PRIMARILY TRAVEL DIFFICULTIES. BE PREPARED FOR SNOW COVERED ROADS OVERNIGHT AND LIMITED VISIBILITIES. SLOW DOWN AND USE CAUTION WHILE DRIVING. 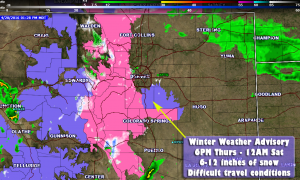 THE NATIONAL WEATHER SERVICE IN DENVER HAS ISSUED A WINTER STORM WARNING FOR SNOW…WHICH IS IN EFFECT FROM 6 PM THIS EVENING TO MIDNIGHT MDT FRIDAY NIGHT. THE WINTER STORM WATCH IS NO LONGER IN EFFECT. GENERALLY 10 TO 20 INCHES. FAVORED UPSLOPE AREAS EAST OF THE CONTINENTAL DIVIDE WILL SEE THE MOST SNOW… WITH TOTALS PERHAPS APPROACHING TWO FEET. ACCUMULATING SNOW ON BRANCHES AND POWER LINES COULD LEAD TO TREE DAMAGE AND POWER OUTAGES. ROADS WILL AT LEAST GET SLUSHY THURSDAY NIGHT AND FRIDAY NIGHT BUT DUE TO THE HIGH SUN ANGLE DURING THE DAY ON FRIDAY THEY MAY NOT EXPERIENCE A LOT OF ACCUMULATION DURING THE DAYLIGHT HOURS. 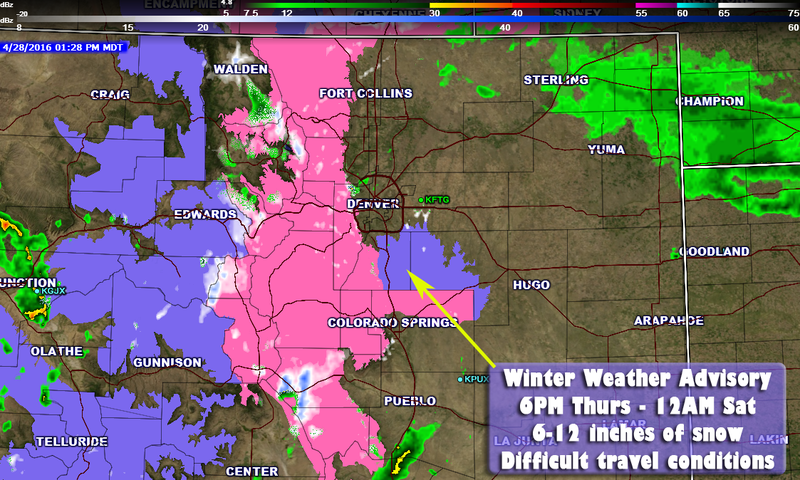 A WINTER STORM WARNING MEANS SIGNIFICANT AMOUNTS OF SNOW… SLEET AND ICE ARE EXPECTED OR OCCURRING. TRAVEL IS LIKELY TO BE SEVERELY IMPACTED. Everything else looks on track about this storm so far. The SREF continues to climb this afternoon with the ensemble forecast for snowfall. This morning we were sitting at an average of 11.83 inches of accumulation between all models. This afternoon we are at 14.07 inches as a mean. I think this may be a bit overdone based on temperatures but does give me higher confidence in the 8-12 inch range for Castle Rock. We’ll keep an eye on it for any changes into this evening.